Heat oven to 350°F. In large bowl, toss apples and 1 teaspoon cinnamon. Spread apples evenly in ungreased 13x9-inch pan. In large bowl, mix cake mix and nuts. With pastry blender or fork, cut in butter until crumbly. Add 1 teaspoon cinnamon and the egg; mix well. Sprinkle evenly over apples. Bake about 45 minutes or until topping is light brown. Serve warm with ice cream. To help keep the crispy topping intact, use a wide spatula to remove the dessert from the pan. Apple crisp is so quintessential to fall, we can’t possibly let our gluten-free friends live without it! The secret is to use Betty Crocker Gluten Free yellow cake mix, which is just as delicious as the original. The rest of this gluten-free apple crisp has all the essential ingredients, like tart apples, ground cinnamon and chopped nuts. 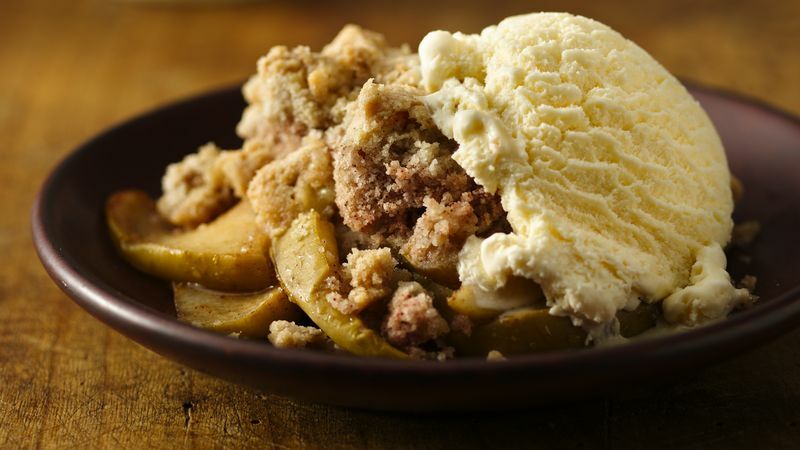 And apple crisp isn’t the same without a hefty dollop of ice cream on top, so don’t forget to grab your favorite tub of vanilla for everyone. If you’re looking to experiment this year, explore more of Betty’s apple crisps and cobblers. Or if you’re new to the world of crisps and crumbles, make sure to read up on Betty’s guide to baking with apples.